Another FIFA World Cup has come and gone. 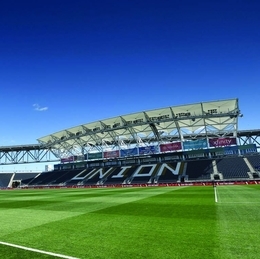 Although soccer fans have to wait four years for the next World Cup in Qatar, there’s still a lot of professional soccer still to be played at Talen Energy Stadium in Chester, home of Major League Soccer’s Philadelphia Union. From now through late October, one man—John Torres, head groundskeeper—will ensure that the Union’s home turf (including the practice facilities) is nothing less than perfect. We spoke with the Ohio-born Torres about his lifelong love affair with “the beautiful game,” his perspective on the challenges of maintaining a natural-grass playing surface in the Northeast, and how he spends his free time away from the stadium. It started as a result of my passion for the game of soccer. In 1994, when the U.S. hosted the World Cup, there was a big buzz during that time, and I think that kick-started my passion for soccer. I played community college soccer, but that was the extent of my career. When I learned I wouldn’t be playing pro soccer, I thought about what else was important to me. I had always helped my mom in the garden, so when it came time for me to choose a major, I went into the horticulture program at Ohio State [University], working toward a turf-management degree. I got to work with the Columbus Crew in Major League Soccer, and through Ohio State, I was able to work abroad with the Arsenal [Football Club of the English Premier League] for a year. That’s when I knew this was what I wanted to do. In England, soccer is the No. 1 sport. After going there and seeing that, seeing how the fields are maintained at the highest standard, it made me want to emulate that kind of commitment. When I came back home and graduated from Ohio State, I found out the [Philadelphia] Union was starting a team. The building that’s now known as Talen Energy Stadium opened in 2010. I came on as an assistant that year, so I’ve been working here at the stadium from Day One. This is my ninth season here, and my eighth as head groundskeeper. Besides soccer, the stadium has hosted everything from heavy metal concerts to rugby tournaments. Is it difficult making those transitions? Soccer is the easy sport. The deal with rugby is actually just transitioning from soccer to rugby—getting the poles assembled, getting the field laid out, getting the logos on the field; a lot of time is spent painting logos. We purchased removable paint from Australia, which is engineered to be washable, and that’s helpful when it comes to removing outside lines or logos. I imagine the field needs a lot of TLC after an event. What’s involved in terms of man-hours and materials? Some weeks I’ll put in 60 hours or more, and then when things aren’t so hectic I can get back down to 40 hours. It’s all about preparation. … Having a strong, healthy field to begin with helps you get through any stressful period. Then it’s about spending the time to do the routine maintenance, fixing divots and making sure everything is smooth and playable—the normal things we do every day. Have you ever looked at the field after an event and thought: What the heck do I do now? We’ve had a few of those occasions—picking up the flooring after a concert, or during a lacrosse match, where you can see the extent of the damage occurring. The key is to know what the damage is and know how to fix it. You have to be able to be able to make the call, if it’s going to require a total renovation with a re-sod or if it’s fixable without renovation. There are two questions, really: What needs to happen; and how much time do I have? If we have the luxury of seven to 14 days, most of the time we can get it back to where it needs to be. But you don’t always have seven to 14 days. You’re around soccer pretty much every day. Do you still love the game? I do. My life revolves around soccer, both in terms of my work and in terms of my family; it all kind of blends together. My wife is a huge soccer fan, too, so she understands the hours I put in. She used to play in a professional league, and now she and I play in a co-ed league in Wilmington. I’m the utilitarian man—I like playing midfield the most—but now that I’m 35, I’m starting to feel the effects of playing for an hour.